It’s on a knife edge in the Mid Week League. A much improved performance by Fairlands Valley Spartans including their women taking second place on the night on Wednesday means the club are now only one point short of the promotion zone from division two to one. Bishops Stortford are on 25 and the Spartans on 24. Critical to their success was the women taking second by only seven race places 108 to 115 squeezing Harlow into third. An impressive 73 Spartans, 29 women and 44 women, ran in the third race of the series which was on an undulating course based on Preston and including Ley Green, the Lilley Bottom Road and Kings Walden. On a warm evening GRANT RAMSAY led in the “A” team in 36 minutes 37 seconds for 12th overall. SIMON JACKSON was just ten seconds behind, thirteenth in 36:47. STEFFAN FORD was 17th in 37:04; BRIAN BRACKSTONE 21st in 37:24 and RICHARD SPRINGALL was also sub 40 at 21st in 39:31. MIKE GREEN, 40:08; BRIAN WHITE, winning the veteran 60 plus category in 40:10; RICHARD BATE, 41:07; STUART HAYCROFT, 41:20; new member CHRIS TILLBROOK, 41:27 and DAVID RIDDELL, 41:28 and STEVE GREEN, 42:13 completed the team. There were three complete twelve man teams. SUZY HAWKINS was Fairlands fastest female coming in with 44 minutes 43 seconds; CLAIRE PULLEN was next in 47:51; HANNAH NEALE in 48:07; ISABEL GREEN in 48:12; RUTH REILLY in 49:55 and HAZEL SMITH completing the women’s “A” team in 50:32. Women’s teams consist of six runners in division two but the Spartans would have done well with teams of eight as VERITY FISHER came in with 50:41 and ROSIE INGRAM in 51:16. As it was the Spartans had FOUR complete women’s teams. Birthday Boy JIM BROWN celebrated by also finishing in 51 minutes 16 seconds. JULIE SIMMONS won the women’s 55 plus category with 53:49. There’s everything to run for in the fourth and final race of the series which will be back in Stevenage on Wednesday evening 28th June. 12 Grant Ramsay 36:37 5MV40. “A” team. 13 Simon Jackson 36:47 6MV40. “A” team. 17 Steffan Ford 37:04 7MV40. “A” team. 21 Brian Brackstone 37:24 8MV40. “A” team. 40 Richard Springall 39:31 “A” team. 49 Mike Green 40:08 “A” team. 50 Brian White 40:10 2MV60. “A” team. 61 Richard Bate 41:07 “A” team. 66 Stuart Haycroft 41:20 “A” team. 69 Chris Tillbrook 41:27 New Spartan. “A” team. 70 David Riddell 41:28 5MV50. “A” team. 77 Steve Green 42:13 “A” team. 86 Mark Collins 43:06 “B” team. 90 Barry Osborne 43:20 3MV60. “B” team. 93 Dean Carpenter 43:30 “B” team. 101 Thomas Sauka 44:20 “B” team. 122 Darren Emmerson 46:21 “B” team. 158 Claire Pullen (F) 47:51 4FV45. “FA” team. 164 Hannah Neale (F) 48:07 “FA” team. 213 Hazel Smith (F) 50:32 “FA” team. 216 Verity Fisher (F) 50:41 “FB” team. 217 James Kilroy 50:42 “C” team. 225 Jim Brown 51:16 8MV60. “C” team. B. Boy. 226 Ros Ingram (F) 51:16 “FB” team. 230 Tim Robinson 51:40 “C” team. 231 Neil Robinson 51:44 “C” team. 232 Claire Emmerson (F) 51:46 7FV45. “FB” team. 237 Lauren Deighton (F) 51:56 “FB” team. 246 Ken Jude 52:45 “C” team. 249 Vishal Shah 52:55 “C” team. 250 Andy Jay 52:58 “C” team. 256 Juliet Fullwood (F) 53:11 “FB” team. 262 Lee Pickersgill 53:36 “C” team. 265 Callum Beasley 53:40 “C” team. 267 Julie Simmons (F) 53:49 First FV55. “FB” team. CRAIG HALSEY did the Marston 5km Friday evening and finished third overall in 16.39. THOMAS SAUKA did the Great Lakes fell race which also incorporated the long course fell racing British championships. He finished in 5 hours 36 minutes. Roger Biggs travelled to Winnipeg, the Capital city of Manitoba, to complete the Manitoba Marathon. The temperature perhaps got up 15C – cool compared with Stevenage – with grey skies and an early rain shower, not to forget the almost perfectly flat course. Despite what seemed a lot of reasons for a good time, Roger completed the marathon in 5 hours 3 minutes 47 seconds. NATALIE LAWRENCE was the fastest Spartan in parkrun action at the weekend, finishing as first woman in a time of 19 minutes 31 seconds at Gorleston Cliffs. VERITY FISHER also finished as first woman, running a time of 24:10 at Millom parkrun. DANNY SUTTON was third man to finish at the same event, in a time of 23:18. Stevenage saw a handful of Spartans running. BARRY OSBORNE ran a new course PB to finish 15th in 20:28 while MARTIN DUDLEY was 41st in 22:26. JAMES SOUTH continues his comeback from injury, pushing a buggy round in 35:27. For the woman VICTORIA BRETT was 18th in 28:29 and MONICA SMITHSON 45th in 30:50. 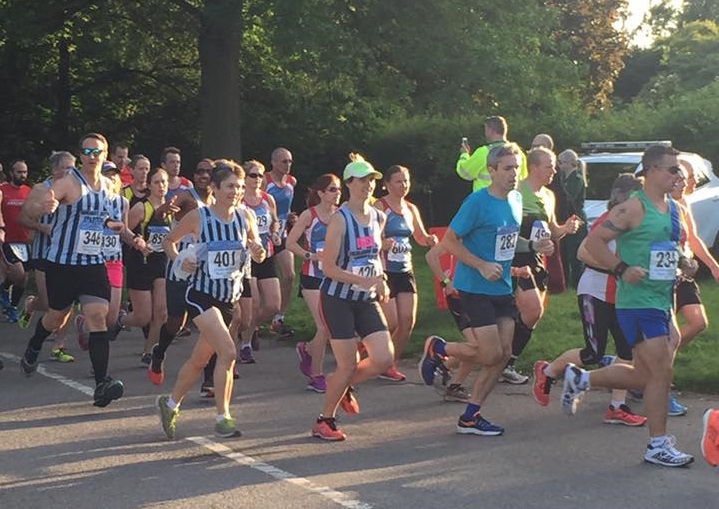 At Panshanger STEVE GREEN was eighth in 19:39, a new course PB, and ISABEL GREEN was 46th woman in 29:22, while NEIL ROBINSON went to Ellenbrook Fields and finished 45th in 23:59. Further afield, DARRYL STEVENS ran at Brockenhurst in 40:31, and KAREN PALMER ran in Jersey, finishing in 28:43.